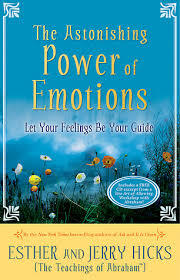 This leading-edge book by Esther and Jerry Hicks, who present the teachings of the Non-Physical entity Abraham, will help you understand the emotions that you’ve been experiencing all of your life. Instead of the out-of-control, knee-jerk reactions that most people have to their ever-changing life experience, this work will put those responses into a broader context. You’ll come to understand what emotions are, what each of them means, and how to effectively utilize your new awareness of them.